I’m super excited by a discovery I made when I was on tippy-toes trying to get a photo of the essiccatoio‘s lovely vaulted ceiling. 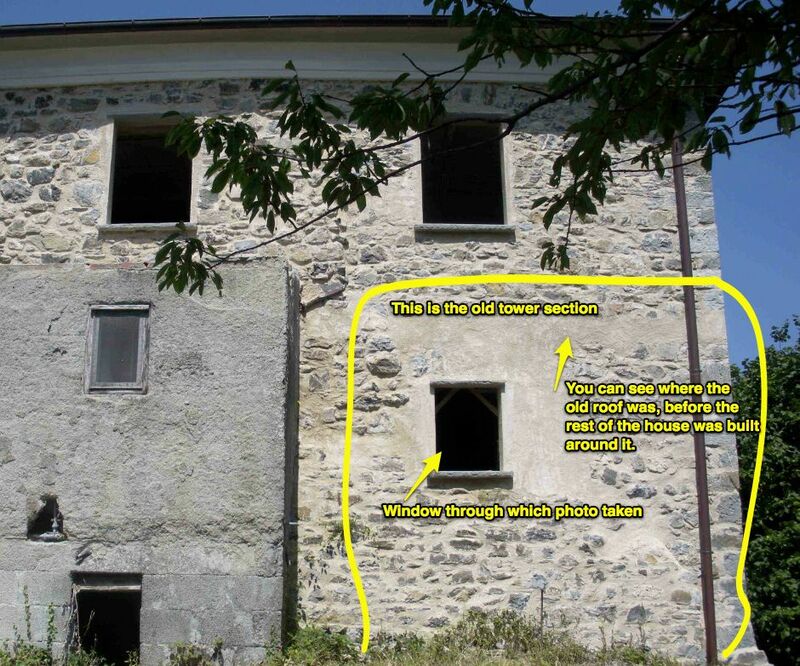 The essiccatoio is the old, original tower, the part that doesn’t connect with the rest of the house. Its ceiling can only be seen by peering through the back window, because inside the view is obscured by a slatted floor midway up (for drying chestnuts). And what does the photo show me on the upper wall? Evidence of a past door! I feel like I’ve discovered a fabulous secret. The vaulted ceiling. On the right side, there was clearly an opening that has since been sealed. Hopefully without bodies inside. 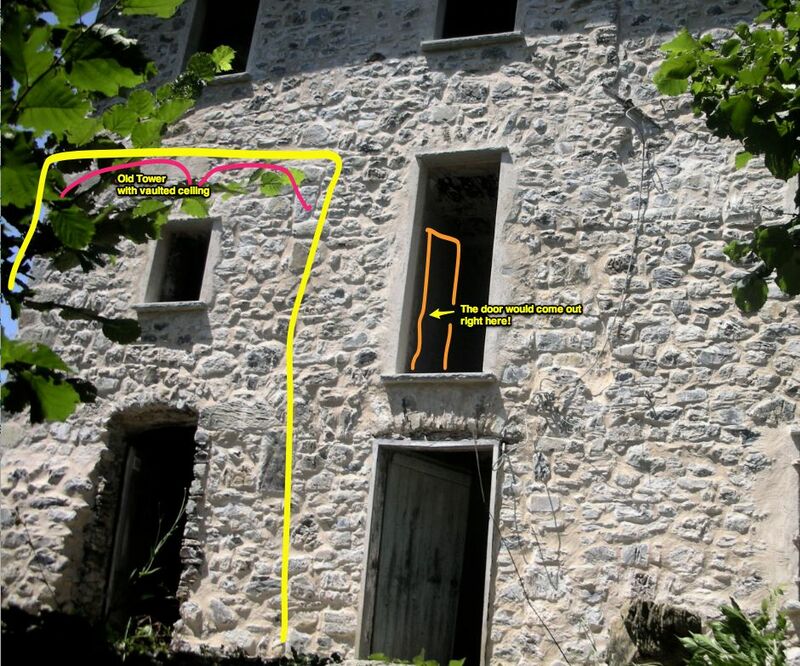 You can see from the plans, shown below, that this old tower is not currently accessible to the rest of the place. I always thought that was a shame, seeing as the ceiling is so lovely, but no-one wanted to risk smashing through a metre-thick supporting wall. Even the crazed Sledgettes know better than that! 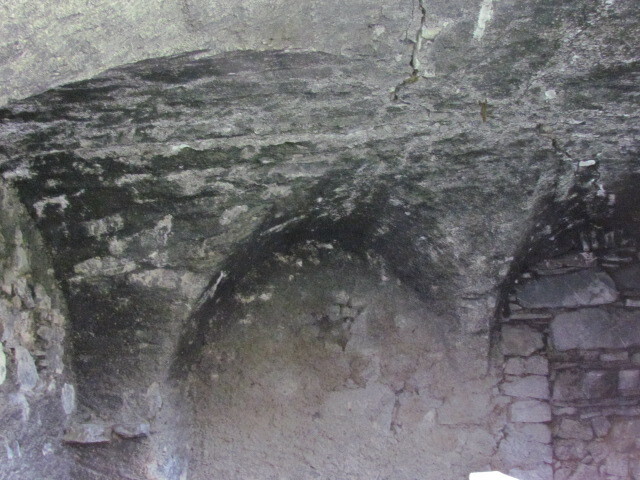 However, it appears that over the newly discovered, sealed door there is a supporting arch and everything. I definitely want to explore the possibilities now. A book-lined den is taking shape in my head. Or a very cool dining room? or…? The point of discovery! That window is just high enough that it’s not easy to see inside. At least not for those of average height. From the front of the villa. Hope this all makes sense to you. The old tower (the part to the left) actually has its own civic number, as though it’s a separate building. I’m sure this has implications for permits to reconnect the two but I’ll leave that battle to our erstwhile geometra Nadia. My part’s the dreaming! So tell me – what would you use this room for? Same thing I’d use any hidey-hole for — a secret writing studio unknown to my children! Everyone needs a hidey-hole! Glad you found the blog. Welcome! That is so cool! It’s so much fun finding little secrets to an old house. This is a big one. Check out the comment from Cheryl Landry regarding an even BIGGER secret door story. I think mine’s just an opening (although a very exciting one). Hers has actual life drama. I’m leaning towards a study too. It’s such an inviting space. Not sure when I’ll be there next – there is a lot of life getting in the way at the moment. Can’t think. Still hung up on the sealed door and thoughts of “The Cask of Amontillado” . P.S. Where is the Future 2nd Bathroom you had once proposed ? Yeah, that second bathroom has also been on my mind as part of this discovery, since it doesn’t yet have a home. 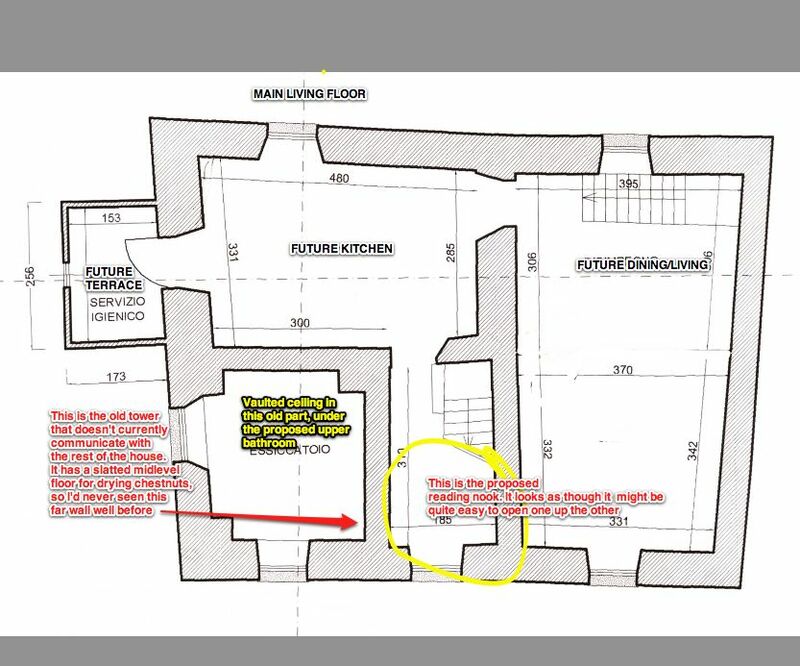 The vaulted room, being directly under the other bathroom is the place a plumber would put it, but I think I’d rather give up some other space first, now that we potentially have extra. We have one spa-sized bathroom so the other can be little. But the spot under the stairs won’t do now, because you’d have to access the new room from the WC. Always some new decisions to be made. That is soooooo exciting! my cousins in Palermo found a “ghost door” when working on the old family estate, behind a plaster type wall. they asked our oldest relative and he didn’t know, upon opening the entrance there was a narrow stairway leading to a small landing, and another sealed door. on the outside of the home were several metal bars sticking out only 2 inches. on the second level.Their geometra researched it, and their was a balcony there at one time. Talking to others in the family one great great uncle remembered hearing that one of the children had fallen from the balcony and passed. Our great, great , great grandmother was so heart sick that she had the balcony taken off, and the doors sealed. Inside the door to the outside it has mi amore alanzo. scratched into it. It has since been restored and the balcony is back. but the cement with the engraving is now part of the floor of the balcony. so many old buildings have these ghost doors. Congrats ladies! your home just keeps getting richer and richer! I hope to someday see it! Seeing as our place was originally the site of a defence tower, I’m sure we’ll have our share of ghosts too – but I don’t think I’ll be topping your story! That’s a GREAT tale. Thanks for sharing it.